Check Pirates vs Corsairs: Davy Jones's Gold from the same studio. 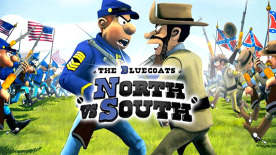 In the colorful strategy game NORTH vs SOUTH, you play the head of one of the armies of the Civil War. Your aim is to conquer American territory. Head up the Yankees or Confederates, and destroy your enemy! Taking up positions, capturing states, assaulting and capturing enemy forts, attacking trains and protecting your railroads . . . you'll have to deal with everything! Capture the port to use the reinforcements coming from Europe. Protect yourself from storms and be wary of those Indians in the war and those Mexican bandits . . . if you don't, you'll be in trouble! Whether you play alone or with others, the objective is the same - emerge victorious from these eventful combats! This cult game from 1990 has been remastered with excellent graphics and is more user friendly. Parameters you can change to your liking! Calm or savagery?